and I really, really like you. Finding a good person to cut your hair is so hard. I finally found someone with the magic touch here. And yea.. every time I sit down to blog lately it's a jumble of nothingness and I exit without saving a copy. I need a new brain. You are right. You should not compare yourself to anyone else. Nobody else could live up to being as lovable and adorable as you. Cut it out! Also? Pics of the hairdo woman! I just wrote a blog about my "blog voice". You can blog about WHATEVER you want to...this is your space! Those of us who want to read it will...I do! I still can't believe about Jasmine. I was going through my wallet today, I never really use it here, and for some reason looked in the little pocket with my Kroger card and stuff like that. and there was Jasmine's business card. sigh. and strange thing, I'm supposed to be getting my first real haircut tomorrow. and I think we need a photo, please. I want to see your choppy cute bangs, mama! And you don't have to relate photos to blog content; that's the beauty of having your own space on the inter webs, my dear. I need a new hair style, and I'm growing out mine, too. I want the whole long hair, blunt bangs style. Which will probably never happen because I'm so impatient. But since I could give birth any day, maybe I will be able to grow it out! 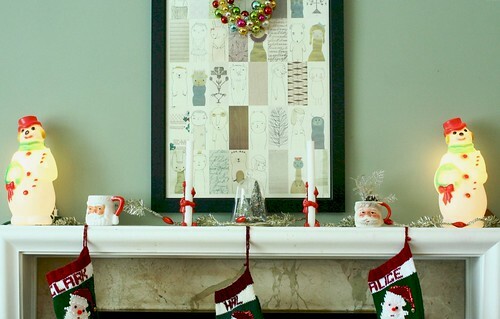 I love the mantle, and I adore you, sweet friend. Go with the topsy turvy, and know we're all sending our love. I think I might have lost my blog voice as well. oy. I wish somebody would comment on the part about looking at the puppet girl. Need to know if other's do that too. That might your best post ever..I want to read the rest of it. i would like to see this cute haircut. and also? i have no idea what my blogging voice is. i have never known. i am a hot mess out there in blog land. Also - I *really* hope you post a picture of your new haircut. I found you singing! I found you singing! And it made my day. Love your lighted snowmen on the mantle. Very cool!